LITTLE EGG HARBOR, NJ — During the first three weeks of the 2017-2018 school year at Pinelands Regional High School (PRHS), rooftop construction was contractually required — supposed — to be completed before the school year began. 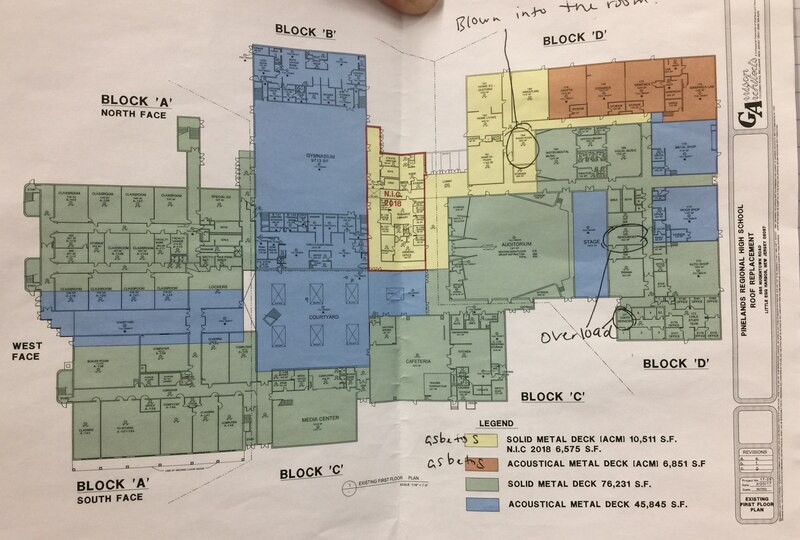 However, in spite of recommendations by the district’s environmental consulting firm, construction continued while the school was occupied by students and staff. This article takes a look back at air quality concerns that arose during that time. At the end of those three weeks, the school was emptied. Until mid-January, both the high school and junior high school functioned on “split sessions,” spending half their days in the junior high school building (right across the street from the high school) and the other half on the internet. Due to unrelated construction activities, it is now possible that the high school will once again be closed for the entire 2018-2019 school year. To interpret the raw results of the air quality tests taken at PRHS during the three weeks in question, we consulted Nick Sodano, a recently retired thirty-year veteran of the New Jersey Department of Environmental Protection (NJDEP). Most of Sodano‘s career was spent on “site remediation,” with the last two years spent specifically on air quality issues in residential and non-residential buildings. 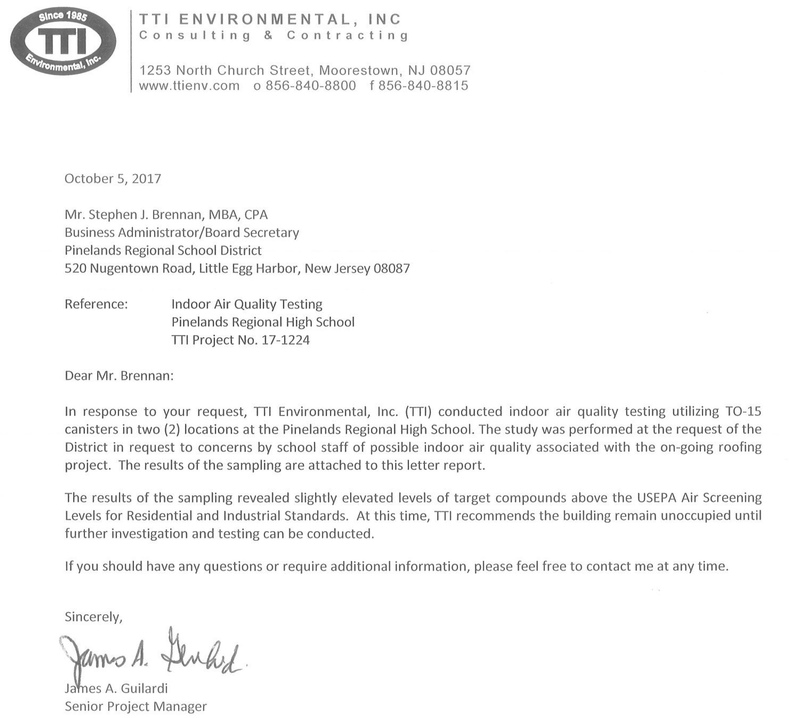 Sodano’s overall assessment (speaking only for himself and not on behalf of NJDEP) is that it was generally safe for students to attend Pinelands Regional High School during that time. The full picture, however, is a more subtle one. Sodano’s full statement can be found in the appendix at the bottom of this article. The NJDEP Site Remediation Program does not get involved with air quality issues inside buildings unless there is an NJDEP-defined “discharge.” A discharge is considered to be a leak or spill of a hazardous substance, such as from a barrel or an underground storage tank or pipe. The situation at PRHS, with debris falling down from a roof and, as Sodano says, “with vapors emanating from petroleum based materials that penetrated roof decking,” does not fit the definition of a discharge. Only air quality reports were reviewed. Therefore, no dust-related concerns were considered. Finally, against the recommendations of the district’s environmental consultant, there was no actual air quality testing conducted during these critical three weeks; only immediately following, after the school was emptied. According to Sodano, the results reported on October 5th and 6th (the specific tests are listed in an appendix at the bottom of this article) correctly indicated that the levels of detected pollutants, though measurable, did not qualify as an emergency or crisis. In the language of the NJDEP, the emergency-level threshold is called the “rapid action level” or “RAL.” If the RAL threshold is exceeded, the situation is indeed be an emergency. In the parlance of NJDEP, an environmental emergency is referred to as an “immediate environmental concern,” or “IEC.” According to Sodano, when the NJDEP does get involved with an IEC, the immediate installation of an “air quality remediation system” is required. Although short term exposure to [Significant] contamination is routinely allowed in cases where NJDEP is involved, it is always done with all parties having an understanding that the condition is not acceptable, especially where sensitive populations are present. For all populations, a plan should be in place to make sure the condition is mitigated. In this instance, the plan could simply be additional testing until the natural curing process causes contamination to fall to non-detectable levels. The district should have specified a date certain, within weeks or months, at which point additional sampling could be reported that proved contaminants were no longer in excess of [acceptable] levels. Alternatively, if contaminants were still in excess of those Limits, then additional measures could be taken to remediate the situation. Sodano believes that the NJDEP did not have the authority to become involved in this particular situation. However, he also believes that NJDEP’s limits on exposure levels were the most appropriate to use – emphasizing that OSHA exposure limits are designed to protect adult workers and are not appropriate for schools. While the New Jersey Department of Health may have had some oversight authority, it is currently unclear if they were notified or involved. Finally, although Sodano asserted all of the above with confidence, he also made it clear that a full analysis is not currently possible. This is because a number of important pieces of information are still missing. These missing pieces of evidence include a thorough accounting of where samples were taken and an explanation of why no samples of “ambient” (atmospheric) air samples were taken. Ambient samples are ideally taken at both the source (in this case, on the roof) and far away from the source, as baseline comparisons. 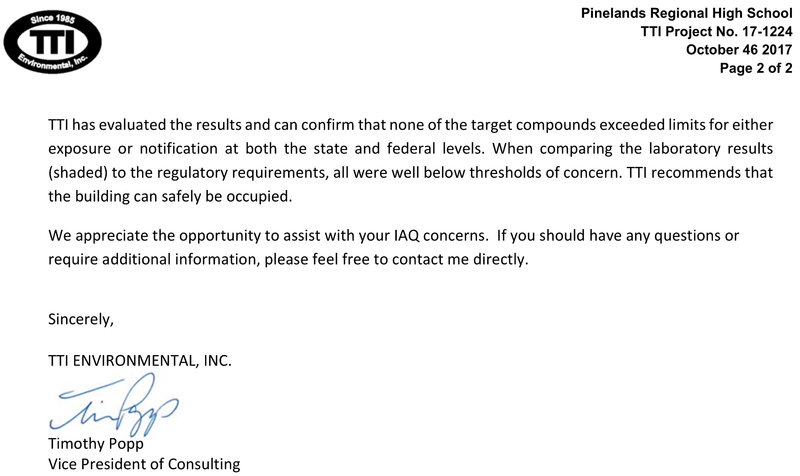 In conclusion, over the first three weeks of school at Pinelands Regional High School, students and staff were exposed to a significant but not extreme level of contamination. Potentially worse than any health effects was the lack of information provided by the district. As mentioned at the beginning of this article, the worst of this was the shock of discovering, three weeks after the fact, that the district’s environmental consultants had strongly recommended that construction be halted. Between the months of October 2017 in January 2018, Citizens’ Media TV provided by far the most in-depth and comprehensive coverage of any media outlet of the Pinelands Regional High School roofing project story. This is our twenty-seventh article on the subject. We were able to do this with the assistance of around fifty OPRA requests at all levels of government (including twenty-three on OPRAmachine). We are grateful to all of those in and around the community who have supported us with their information, encouragement, expertise, and guidance. We wish the students, parents, and community the best of luck and health in the upcoming years. Thank you for having us. The following is my personal opinion and in no way represents the NJDEP [New Jersey Department of Environmental Protection]. My qualifications in the subject area come from my experience as a “Site Remediation” staff member at NJDEP which spanned 30 years as a professional, the last two years of which were spent creating sampling plans for indoor air evaluations of residential and non-residential buildings. The October 5th 2017 TTI letter to Pinelands Regional Board of Education is correct in terms of its assessment that a “Rapid Action Level” [RAL] concentration was not detected. With regard to notification [The requirement that the district must notify the NJDEP], it may be correct since apparently there is no regulated discharge, but in terms of the contaminants detected, I do not believe the lack of RAL level contamination would eliminate the need to notify. I will discuss that issue below. Since a RAL condition was not found, the TTI letter is essentially saying that air quality measurements did not uncover an “immediate environmental concern” [IEC], which is a condition that warrants immediate installation of an air quality remediation system. However, the letter leaves unanswered relevant questions, especially regarding the “vapor concern” contamination concentrations detected in the school. While the contamination is apparently not due to a regulated “discharge”, it is still worth noting the August 2016 NJDEP “Vapor Intrusion Technical Guidance” [the VIG, which is the NJDEP’s table of thresholds for contaminants] states that a “Vapor concern” [a “VC”] exists when “contamination in indoor air exists at a level greater than the Department’s applicable Indoor Air Screening Level (IASL) but less than or equal to the associated RAL…” Based on this guidance, there appears to be “VC” level contamination measured at the school. In my opinion, the VIG can provide useful guidance in this situation despite the lack of a regulated discharge. First of all, I note that the VIG states that “case managers from the Department’s Immediate Concern Unit (ICU) are assigned to all IEC and VC sites”. So, VC conditions should also be brought to the attention of NJDEP for any case involving a regulated discharge. I expect it is the lack of a reportable discharge that excludes the NJDEP from notification in this instance. However, I would inquire whether the NJDOH [New Jersey Department of Health] has some oversight authority here and perhaps should get notified. Other questions I have is whether the School Board intends to revisit this contamination issue with additional samples at a time certain, or what other mitigation measures it envisions as warranted? Will the School Board provide, for the sampling plan just implemented, a list of all T0-15 sample locations by room number, date and sample designations, with summary tables of all results, a statement as to whether any ambient samples were collected on the roof and grounds? A brief discussion as to where in the school the original odor complaints arose and whether investigation revealed locations where roofing materials actually entered the school? Provision of MSDS sheets [Material Safety Data Sheets] from the roofing contractor for materials used at the site and a diagram showing the locations where these materials were used? A discussion as to whether background conditions inside the school were assessed by TTI staff to eliminate possible background sources of VOCs in closets and other storage areas? In my opinion, the provision of these materials and answers to these questions could satisfy questions I had after reading the materials you provided. This first test, sampled on October 3rd and reported on the 4th, looked for the presence of asbestos, and did not find any in eighteen samples. 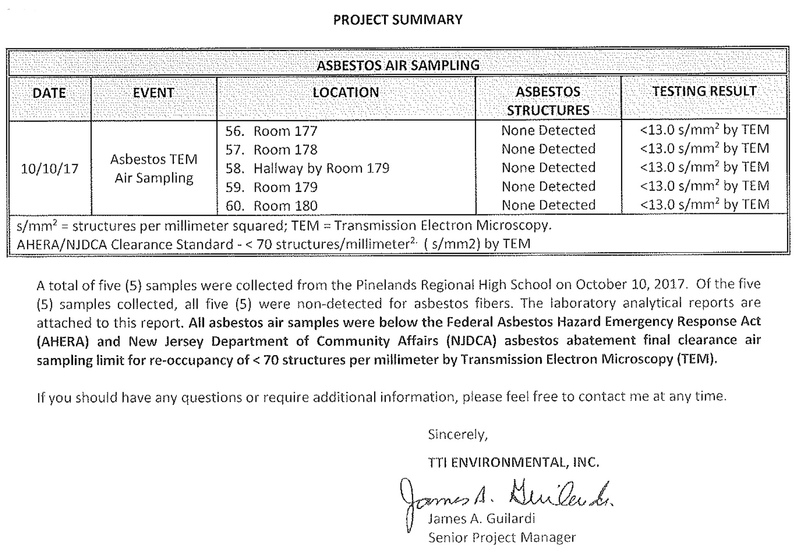 A retest, sampled on 10/9 and reported on 10/10 also found no asbestos, this time only in five samples. There were two rooms sampled: “upper level-media” and the “landlocked” room (containing no windows all), room 164. 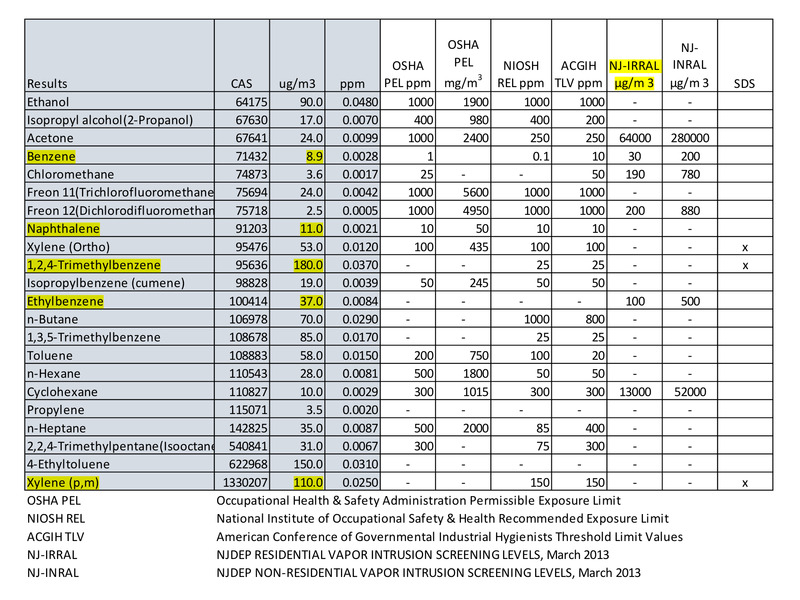 All the tables in this article contain only those contaminants above the “normal and safe” threshold. In the screenshots they are indicated by red flags. TTI has evaluated the results and can confirm that none of the target compounds exceeded limits for either exposure or notification at both the state and federal levels. When comparing the laboratory results (shaded) to the regulatory requirements, all were well below thresholds of concern. TTI recommends that the building can safely be occupied. Previous Post: OPINION: Tom MacArthur fights for the NRA, not for us.